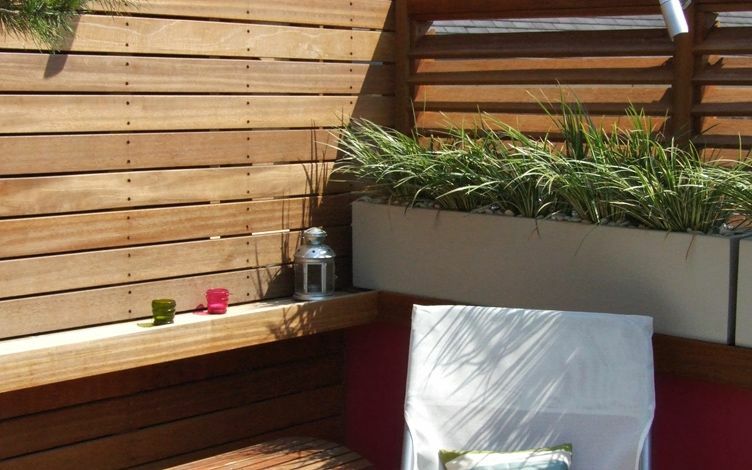 Although super tiny, this 7-square-metre Bermondsey roof terrace maintains a robust outdoor structure, sustained by a warm garden design. 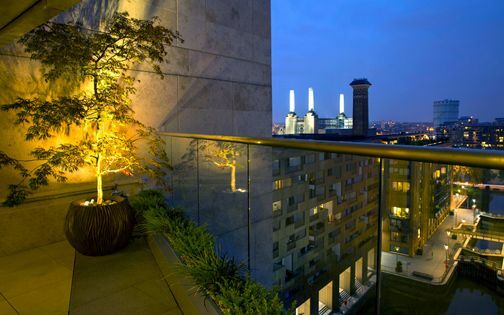 Cosily perched along a unique SE1 sight line, directly facing the city within a dual north/south aspect, the rooftop's framework seamlessly keys into its authentic, converted loft fabric of London brick, timber flooring and steel detailing. 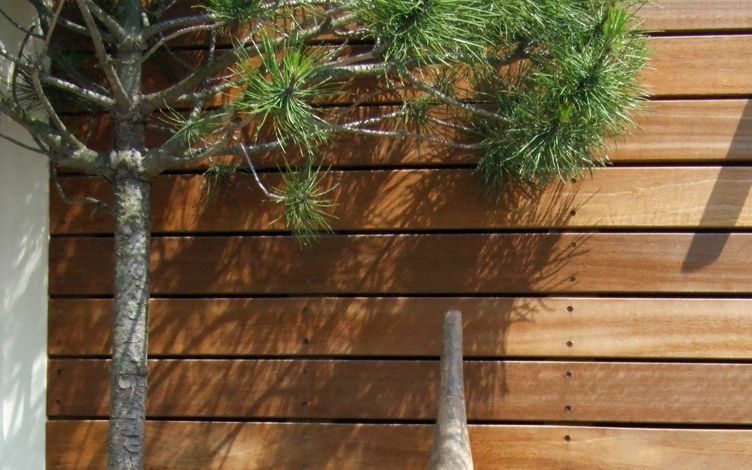 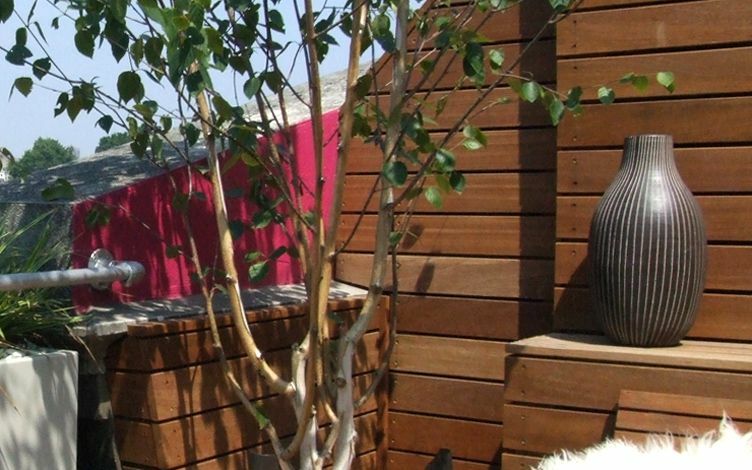 A hardwood continuum defines diverse planting mediums, cladding, decking, screens and gateways, which are elevated with low-key foliage and bubble fountains – discerningly accessorised by our clients. 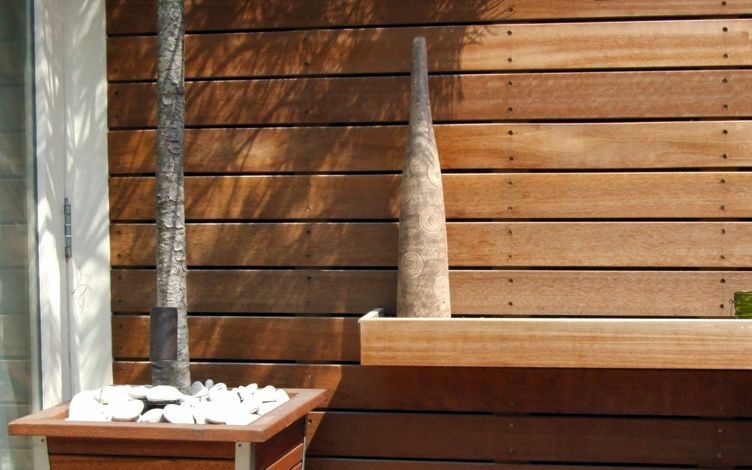 The Morocco Store, at 1 Leathermarket Street, is tucked away at the heart of Bermondsey's cultural milieu, amid a low-rise architectural setting, where its structure's bare bones are preserved in an array of brick, concrete, steel and timber details. 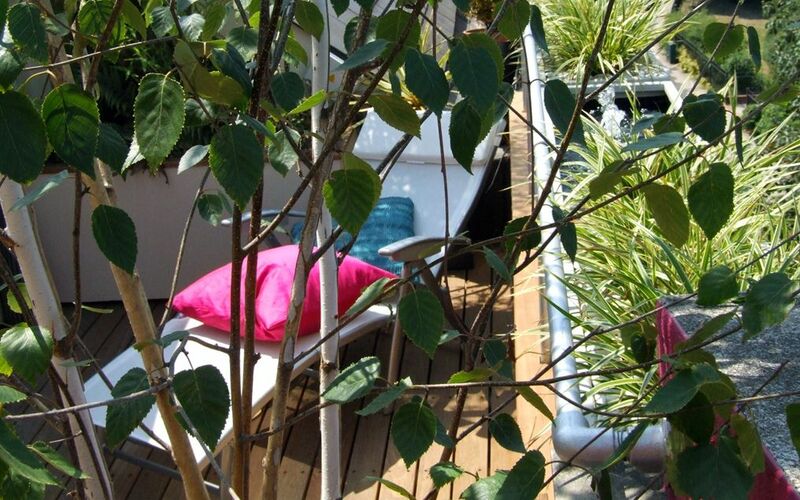 When our clients moved into this top floor loft apartment with two rooftop terraces, there was no delay in transforming its outdoor spaces to maximise liveability and sustain continual use. 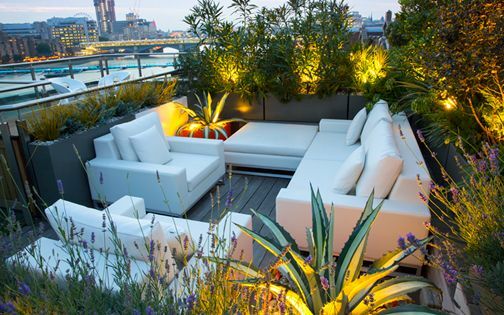 The two-floor interior comprises a vast hollow core, enveloped by small roof terraces on either side, and presents a textural medley of modern gadgetry, ethnic artefacts and subtropical flora, orchestrated by our charismatic, flamboyant clients. 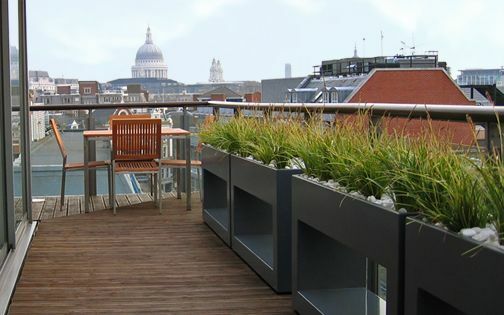 Soon after commencing this project, the neighbours approached us to design their trio of roof terraces, and given an interconnecting fire escape route, we set out to reinvent the building's outdoor essence with an integrated sequence and a verdantly landscaped frontage. 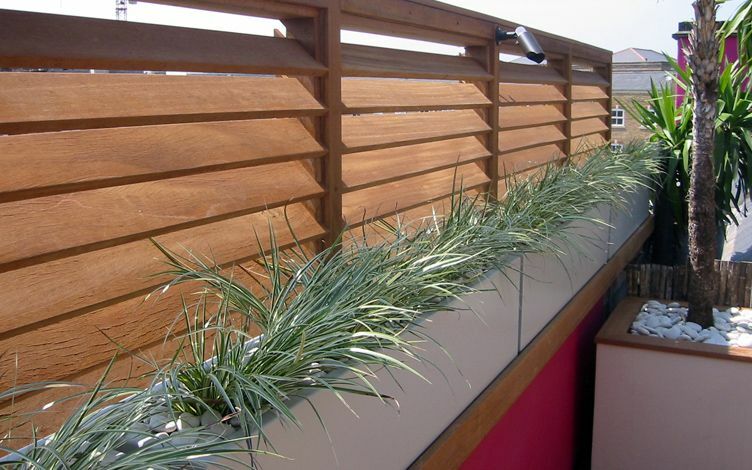 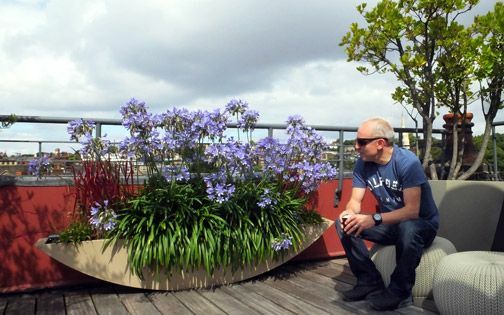 While the roof terraces' concrete walling wasn't presentable, we utilised smooth Balau hardwood to build cladding, and mitigated its obtrusiveness by producing a congruous indoor-outdoor synthesis of decking, shelves and custom-built planters. 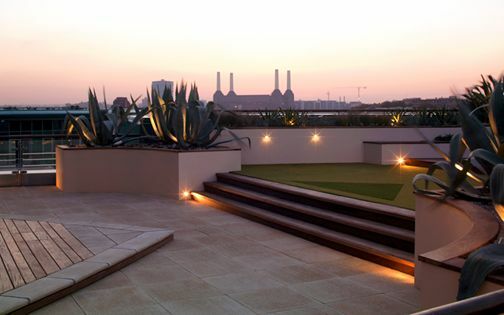 While the north terrace's vista remains unobstructed, featuring expansive landmark views, the south-facing roof terrace required privacy from Antonine Heights in City Walk, off Bermondsey's Long Lane. 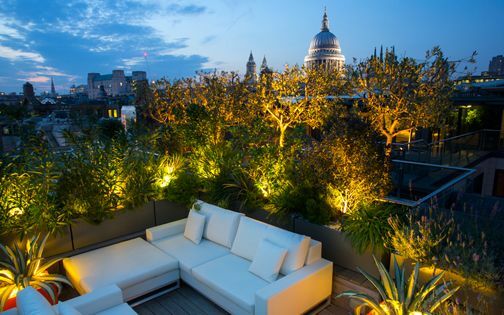 We devised an original louvre screen to enhance seclusion, and let sunrays filter to the terrace. 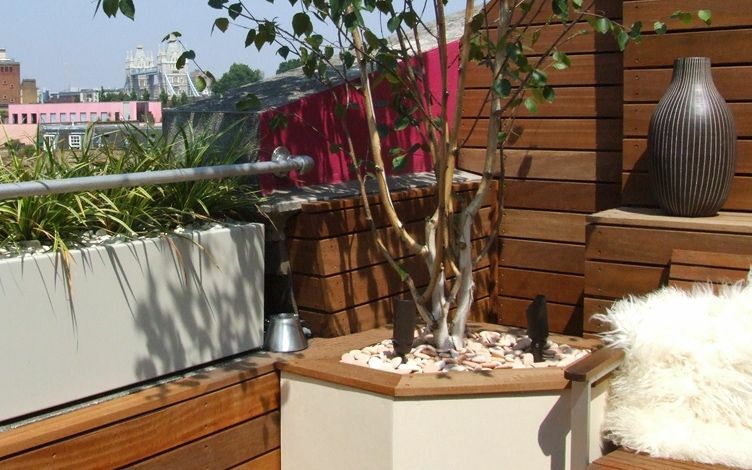 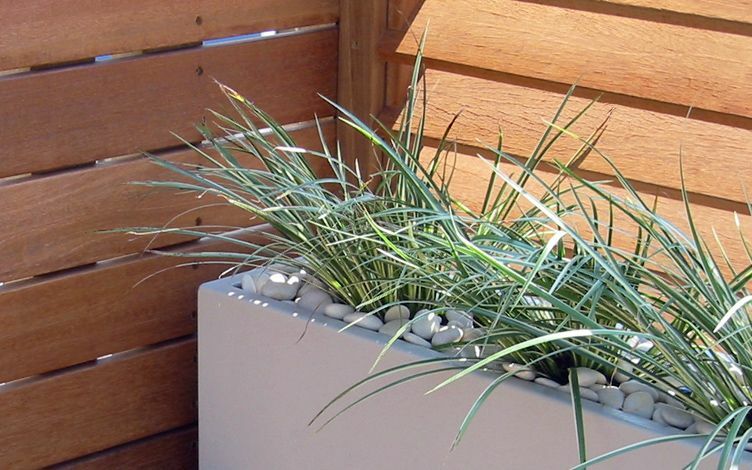 To save precious horizontal space, the planting is positioned along the rooftop's parapet wall, augmented by focal point tree receptacles. 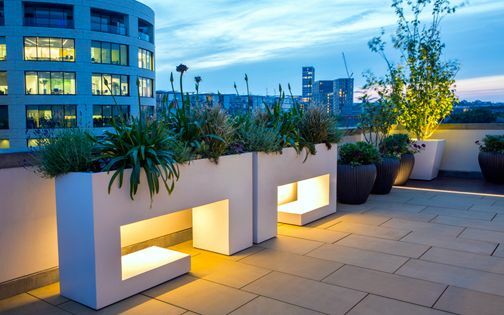 By designing angular patterns, maximising vertical space and infusing a high contrast colour scheme, this minuscule roof terrace extends its spatial make-up through transient daylight nuances, textured foliage and reflecting, powder-coated roof garden troughs. 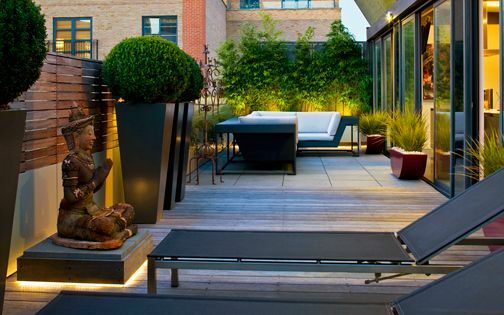 With non-stop vibrant music immersing this quaint loft backdrop, its rooftops' inherent intimacy, albeit nondescript design beginnings, was amplified by our clients' inspiring pursuit of detailed perfection and cultural gusto. 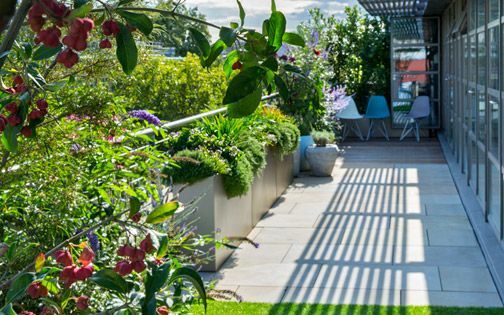 The north-facing roof terrace features a multi-stemmed Himalayan silver birch tree, forming a dainty canopy above evergreen sedges which flank a water trough displaying three bubble fountains. 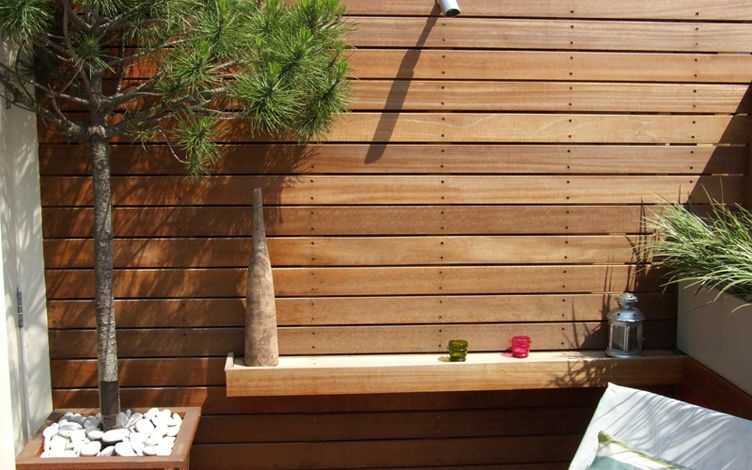 Wood details are continued from the second roof terrace and interior to generate a hardwood continuum – maintaining a cohesive expanse, and enlarging apparent depth amid outdoor compactness. 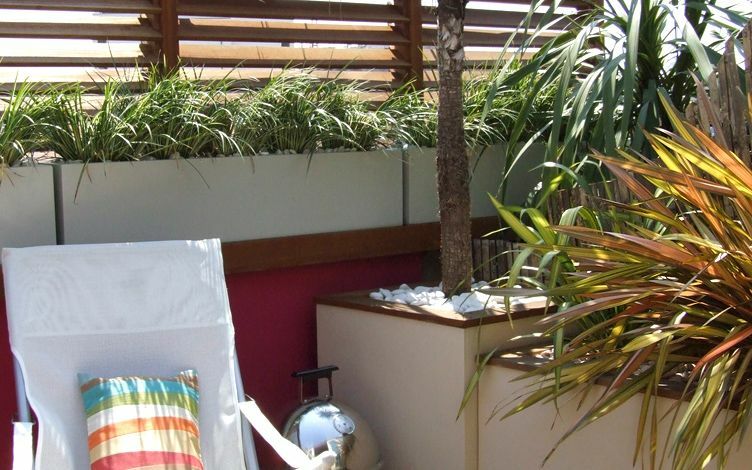 Across both rooftops, the remaining rendered walls were coated in vivid magenta pink, reiterated with lush clumps of Phormium ‘Apricot Queen’, bright upholstery and a spectrum of personal ornaments. 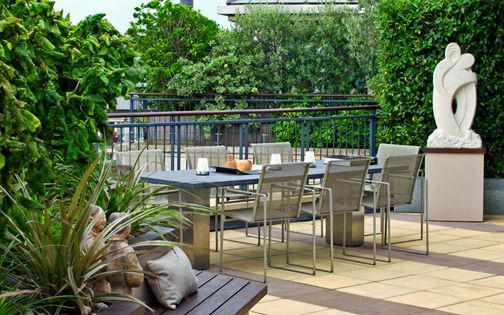 Fond of alfresco cooking, sunbathing and relentless rooftop socialising, our clients' passion for loft living, their home and rooftop terraces surpass confined outdoor spaces through sustained multifunctionality. 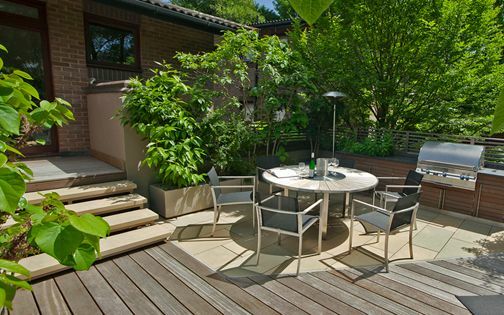 Throughout this unique project, our in-house design & build team redefined the site's outdoor usability and ergonomic cosiness to instil a highly detailed narrative which articulates multilayered fluidity and architectural leafiness. 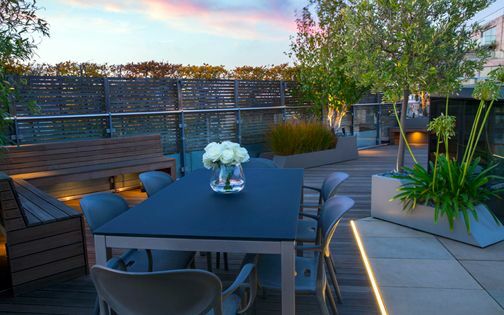 With two sets of clients, 5 pocket-sized roof terraces and a 7-week timetable, we transformed a lacklustre terrace blueprint into a rooftop sanctuary, evocative of its loft surroundings, by reciprocating an abundance of roof terrace ideas with our clients. 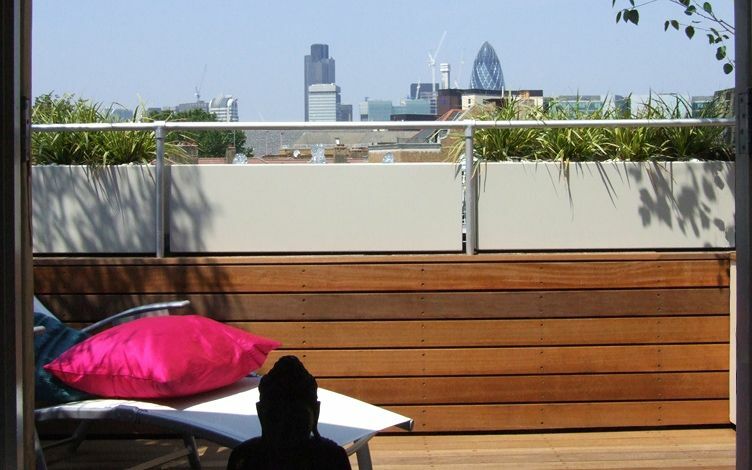 Working continually in this Bermondsey vicinity and nearby Borough, London Bridge and Shad Thames, we relish the prospects of designing liveable outdoor environments which integrate contemporary garden design principles and low upkeep soft landscapes into a minimalist hard landscaping mindset – to produce original roof terrace designs which define both our clients' aspirations, as well as extend our private London roof terraces repertoire.